After all the outrage over his performance at last year's Golden Globes, it seemed like the English funnyman wouldn't be able to get nominated by the Hollywood Foreign Press Association, much less get invited back as emcee. After talking it over with NBC, the HFPA has voted in favor of bringing back the often-controversial Gervais, reported Variety. 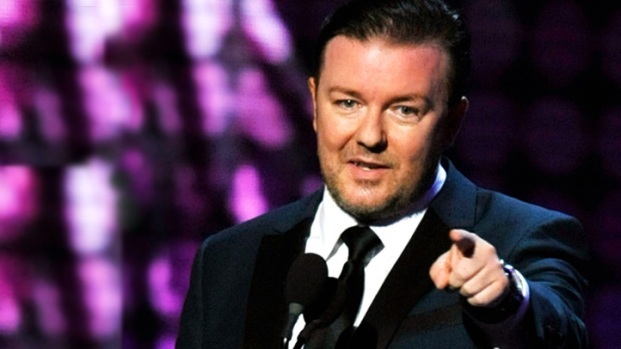 The Golden Globes' offical Twitter feed confirmed the news moments later, announcing that, "Ricky Gervais will host the 69th Golden Globe Awards on January 15, 2012." Gervais caught many off guard during his first stint on the show in 2010, unleashing his biting wit on seemingly everyone in the room. The initial reaction was such that even he was surprised when he was invited back. "I'm going all out this time," said Gervais when his second invite was extended. "I'm going to make sure they never invite me back." His work at this year's Golden Globes was even more cut-throat, prompting HFPA Phillip Berk to say "(Gervais definitely crossed the line...and some of the things he said were totally unacceptable." The HPFA explained on its website Wednesday that not everyone was thrilled with the decision to bring back Gervais, Variety reported. "While many welcome Gervais's return, not everyone is happy with the decision because last year his blunt one-liners targeting big-name celebrities caused anger and resentment in some quarters," they said. "After the show Gervais dismissed the possibility of coming back for a third time, but he gradually warmed to the idea and last month met with HFPA President Dr. Aida Takla-O'Reilly in Paris to discuss it." Rumors started brewing a couple of weeks ago that Gervais might be back. We can't help wondering if this hadn't been the plan for some time now, especially after watching this video Gervais made with Depp. Here's Piers Morgan and Gervais riffing on the news on Twitter.